The PMP Certification Exam questions assume that you have a robust, documented Change Control process for your project, and also that the Change Control process handles changes to the product, project, and all project management plans and project documents. Change control starts with a change request. Change requests can include corrective and preventive actions, as well as defect repairs. 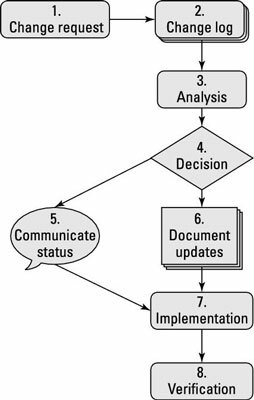 Following a Change Control process requires a series of steps. Change request: A stakeholder fills out a change request. Change requests can come from any stakeholder on the project. At this point, the Status would be open, and the Disposition field would be blank. Analysis: You need to fully understand the impact of the change request across all areas of the project. This is where the project management plan comes in handy. Even if the change is not optional, you should still analyze and document the impact on all areas of the project. CCB meeting: The change request and the completed analysis go to the change control board. The CCB approves the change, denies the change, or defers the decision until more information is available. At this point, the Disposition field of the change control log is filled in. This is called the change request status update that is the output from the Perform Integrated Change Control process and an input to the Direct and Manage Execution and the Perform Quality Control processes. Communication: Approved changes are communicated to all impacted parties, and the change is implemented. If the change isn’t approved, the stakeholder is advised of the reasons why the change was not approved. Document updates: For changes that are approved, the project management plan and the appropriate project documents are updated. Implementation: Implementation of approved changes is managed via the Direct and Manage Project Work process. Verification: All approved change requests are verified in the Control Quality process to ensure that they were implemented as approved. Managing change, analyzing change, updating documents, and communicating about change all take time. You need to take into consideration that part of your time as a project manager, as well as part of your team members’ time, will be taken up by these activities. Everyone must follow the change control process, regardless of her position in the organization. If your sponsor or the customer demands a change, you may have to implement it, but you still have to submit a change request, log the change, analyze the impacts, and so forth. The fairness standard “We apply the rules of the organization without favoritism or prejudice” from the Code of Ethics and Professional Conduct should be applied throughout the project, but you may find particular relevance when it comes to maintaining a rigorous change control process.